People often say that kids are like sponges, effortlessly absorbing all the information they encounter. How true!Consider kids who are exposed to two languages in their home and are bilingual before kindergarten, or the children of sports enthusiasts who can spout off rosters and stats when they are only bat-high themselves. And when the classroom learning begins – look out! These sponges enthusiastically drench dinner conversations with their new-found knowledge, wowing all who will listen with facts they’ve absorbed during time spent with friends and teachers during the day. But what happens to this metaphor During the hot, dry months of summer?What becomes of our little sponges?I, for one, am determined that mine will not meet the same fate as the pitiable kitchen numbers that stray too far from the sink. There will be no crusty, impenetrable, brick-like sponges in my house this summer if I have my way.When I heard the first lifeguard whistle of the pool season, I said, Game on! I have a few tricks up my sleeve to assure that the brains in my family continue soaking up knowledge all summer long. 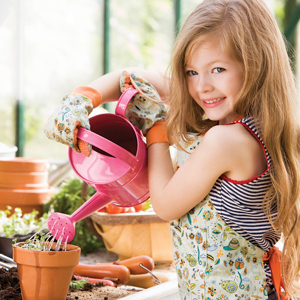 Whether modest or impressive, family gardens are science in action. Our little seven-pot haven boasts summer squash (begun at school), sunflowers started from the seed, cucumber, zucchini, and a few tomato plants started with love by the boys’ grandfather. Here, we learn lessons about what living things need to survive, what interferes with survival (bugs, root-rot), and how good it feels to nurture something from seed to sprout.Mom and Dad love the extra veggies.The kids prefer the towering sunflower with seeds that promise we can do this again and again. Cooking is math made easy and fun.Even a simple brownie mix requires a child to find ¼ and ½ on a measuring cup, and with delicious results. There need not be a quiz on fractions, but life is learning here. Altering recipe quantities is a job for the older siblings, doubling and tripling as needed for whatever lemonade stand might be set up in the evening. Lots of families hit the road in the summer. To the beach, to Gramma’s – the destinations vary, but the journeys are almost always rich with material. For our family, a paperback Rand McNally Kid’s Atlas opened up a world of learning. In addition to state facts, the atlas provides a checklist of state license plates at the back of the book. My oldest son started checking off states on an hour’s drive north, and the rest was history. Well, geography actually! We made similar checklists for the other boys, and Interstates 95 and 64 became impromptu classrooms. My kids are aces at geography now – at least in the U.S. – and they fully comprehend why South Dakota is the only license plate we have not seen yet (so far away with such a small population). What kid doesn’t love a collection? Our house boasts more than its share: coins, rocks, baseball cards, and Hot Wheels, to name a few. A summer’s relaxed schedule allows kids to embrace these passions. We love to roam the neighborhood and Park in search of a worthy rock for my youngest son’s collection; we hoard our snack-bar change if it contains a state quarter from my middle son’s collection; and my oldest can be relied on to splurge his allowance on an occasional pack of baseball cards, in hopes of rounding out the Red Sox roster in his big binder. Each child’s stash, while space-consumptive, offers its own lessons. If nothing else, the boys have learned to guard them well and share their enthusiasm with our extended family. The library is one of my favorite places in the summer. It offers a cool, quite respite from the rest of the world. And books, of course! We can’t get enough in the summer. Beyond the predictable book-list fiction, there is an answer to every question a child can ask. Learn magic. Teach yourself a card trick.Memorize a few jokes for the dinner table. And while you’re at it, find us a decent recipe for all our extra zucchini.If knowledge is not incentive enough, every library and book store in the area offers tangible rewards for tracking your reading. Who cares if they are reading for free ice cream—they are reading! The school bells will stop ringing for a while, but do not dismiss easy opportunities like these. Gather your sponges and explore the vast summer classrooms. From backyards to ballparks, camps to car trips – help your kids soak up all there is to learn.